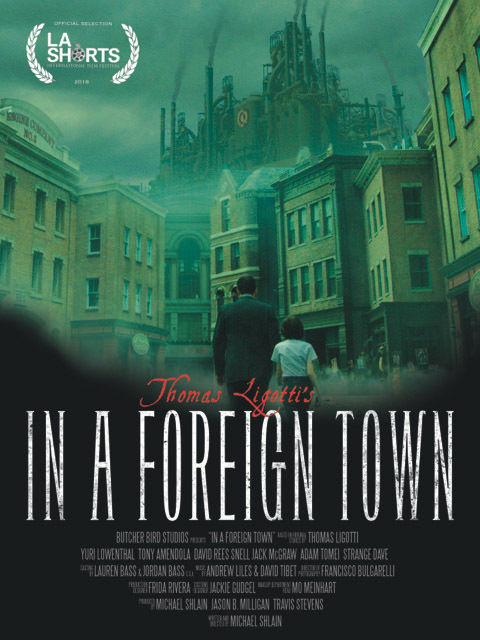 We are thrilled to announce that IN A FOREIGN TOWN, our short film based on the works of acclaimed author Thomas Ligotti, will be having its World Premiere at the LA SHORTS INTERNATIONAL FILM FESTIVAL. The screening will take place on Saturday, July 28th at 3:15 at the Laemmle NoHO7 in North Hollywood. TICKETS can be purchased at the Laemmle’s website. Please reference Program #16. Written and Directed by Michael Shlain, IN A FOREIGN TOWN stars Yuri Lowenthal (SPIDER-MAN PS4, BATMAN: THE DARK KNIGHT RETURNS), Tony Amendola (ONCE UPON A TIME, ANNABELLE), David Rees Snell (S.W.A.T., THE SHIELD) and Jack McGraw (GODLESS). The short film was created as a proof-of-concept for a television series currently in development. Stay tuned to your favorite Butcher Bird news feed for more updates on the short film, the series and how you can get involved to help us bring existential horror to the world. In the meantime, to learn more about Thomas Ligotti and order his books, visit Penguin Random House. Griffin Davis is the roving assistant of Butcher Bird Studios and a graduate of the Literature program at the College of Creative Studies at UCSB. While at college, he wrote for the satire magazine Gaucho Marks and became the editor-in-chief his junior year. He has interned for a Bollywood post production sound house in Mumbai, India, as well as for Literature for Life, an educational literary journal here in Los Angeles.